9/10 – The Phillies announced that they would not extend the contract of Ruben Amaro and elevated Scott Proefrock to interim GM effective on that date. 10/26 – Red Sox hired Ruben Amaro to be their first base coach. 1/2016 – The Phillies hired Google’s Andy Galdi to be their Director; Baseball Research and Development. 2/25 – Red Sox owner Jack Henry announces that the team is going to rely less on analytics. Observation: So, the Red Sox, who have been recognized as the team that was most reliant on analytics, are now moving away from them. Conversely, the Phillies, the team that has avoided analytics, have developed their own statistical computer system (PHIL) and are creating an analytics department. All this in the 6.5 months since Amaro was released by the Phillies and in the 5 months that he was hired by Red Sox. Hmm. 2/19 – Phillies signed FA OF Juan Carlos Smith, an 18-year old Dominican born on 8/22/97. He’s 6’1, 180 lbs. No further information available. The stadium gun was turned off today. Jeremy Hellickson and Aaron Nola retired the first 6 Spartans. Nola’s first pitch had a lot of movement. He recorded the Phillies’ first strike out. Mujica got hit around pretty hard. Ernesto Frieri allowed 2 base runners, but was helped out when Jorge Alfaro gunned down the lead off batter on an attempted steal. Elvis Araujo pitched a quick 1-2-3 inning. Chris Leroux gave up a hard hit double. Daniel Stumpf looked good. He had to retire an extra batter when Andrew Knapp, Darnell Sweeney, and Nick Williams couldn’t come up with a pop foul down the right field line. Side-arming Greg Burke had little trouble with the college batters. Although, he seemed to have a little difficulty with the two left-handed batters he faced and fared much better against the right-handed batter. Colton Murray pitched the ninth and got the final 2 batters on backward Ks. Knapp’s in the first inning. The Phillies’ offense showed up early and often. Odubel Herrera led off and reached on the first of his 2 line drive singles. He promptly stole second base. With one out, Aaron ltherr lined a single to right, but a charging right fielder kept Herrera at third. Darin Ruf was hit by a pitch to load the bases. Knapp pulled a hard hit ball into the second base hole that the first baseman got some leather on and redirected into right field. Two run scored. Alfaro grounded sharply to third and beat the relay throw to allow the third run to score. Angelys Nina hit a ground single to left and stole second. Couldn’t tell if the throw beat him and the shortstop couldn’t control it or if the ball hit Nina on the slide. In either case, he wasn’t very quick to the bag. He scored on Herrera’s second hit, a line drive single to center. Roman Quinn entered the game for Herrera in the top of the third. After Edward Mujica allowed Tampa to close to 4-3, the Phillies restored their 4 run lead with 3 in the third. Ruf reached when he bounced a single over the third baseman for a single. Knapp drew a walk, with Ruf running on a 3-2 pitch. Alfaro drew a walk on the 3-2 pitch to load the bases. Emmanuel Burriss was hit by a pitch to force in a run. Nina grounded a single to left that score two runs. Quinn flied to center to end the inning. Ryan Jackson’s ground single to through the box drove in Burriss who had tripled to center to close out the scoring. Quinn fouls one off before his fly out to the gap. I had a pleasant conversation with Chris Wheeler. I don’t care how the board feels about him. I like him. He is the most personable, unassuming personality I ever met. Okay, he’s right up there with Larry Andersen. Nola’s first pitch looked like an optical illusion the way it moved left-to-right. On the steal attempt, Alfaro threw a bullet to the bag. Second baseman, Angelys Nina, only had to move his glove slightly to the left to tag the sliding runner as he slid to the outside to avoid the tag. Yeah, his pop is a little slow though. Jackson and Alfaro let a foul pop drop between them. I don’t remember the pitcher at the time, but he would have been better served if he went and got it himself ala Cliff Lee. 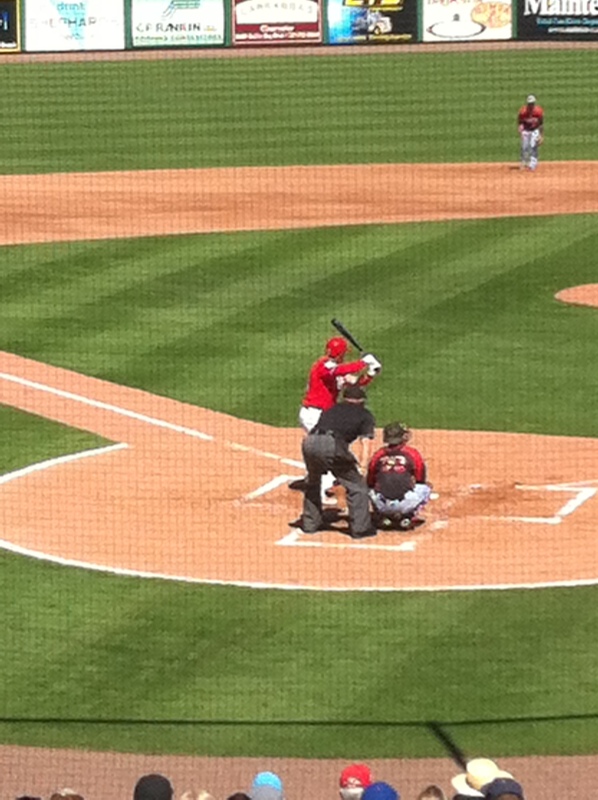 Twice Alfaro got in front of the pitcher 3-0 and fouled off the next two pitches. He walked the first time and struck out mightily the second time. Quinn crushed a ball to the right field wall in his second at bat. Sounded like it was leaving the park on contact. The recorded 8 MPH wind must have knocked it down. Altherr had a similar result on an earlier at bat. Quinn ran a long way to drop a fly ball in shallow right center for an error. I thought it was the type of shallow pop that Utley always took charge of. The same for the ball that dropped in among Sweeney, Knapp, and Williams later in the game. The ball Burriss hit for his triple was crushed to the CF wall. He flew around the bases. Possible candidate for the 25th man (with Sweeney and Asche assuming that Tyler Goeddel remains on the roster). Knapp DH-ed and replaced Ruf at first in the seventh. Moore replaced Alfaro in the sixth. Peter Bourjos made his first start in left field. So, of course, the first batter lined out to him in the first inning. Williams grounded out to short and was out on a close play. He looked like he was slow the first 30 feet down the line until he turned on the after burners. He also showed off a wild, buggy whip swing during the at bat on a pitch that fooled him. Knapp missed out on another hit on a sinking line drive to center that required the fielder to dive to make the catch. 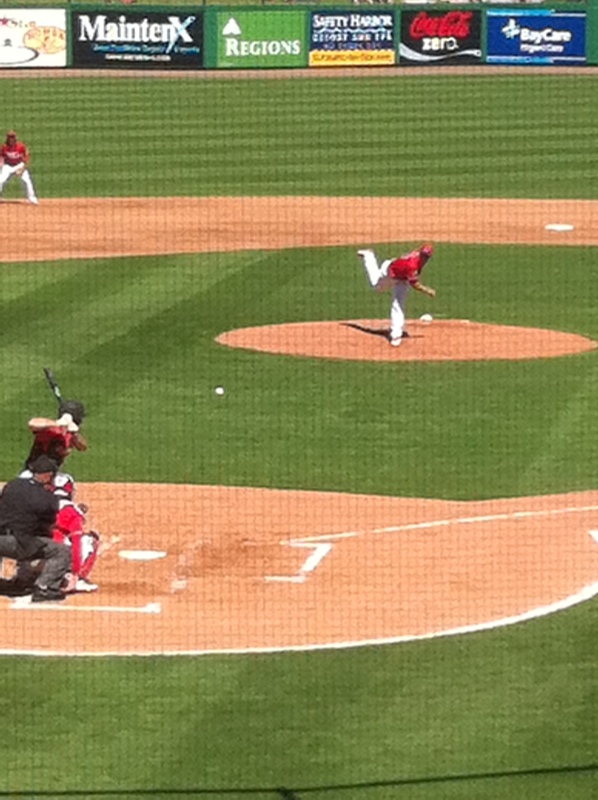 Ruf struck out on a pitch low and away against a right-handed pitcher. Mirror image of Ryan Howard. I attached the box score here. I didn’t think to check if the Phillies had it on their site until after I put the pitchers lines above. My buddy, Stick, is one of the ushers. He predicted a 12-2 Phillies’ victory. He was more correct than the rest of us down here. Murray looked sharp. So did Hellickson, Nola, and Stumpf. I assume Araujo, too, but I had walked away and he finished before I could get back. Tampa brought their cheerleaders and dance team. They gave the Phanatic a run for his money. 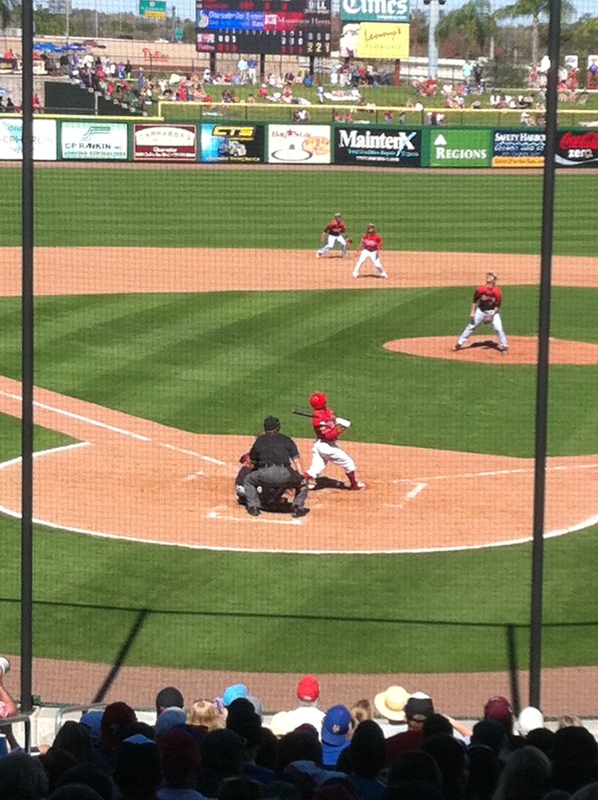 Bourjos was a weak 0-3. Nina was the only Phillies’ batter to get 2 hits. Nina and Knapp each had 2 RBIs. I hope the stadium gun works during the Grapefruit League games. The Victory stand is back and in it’s same location. The tarp is a generic green in place of the old Tilted Kilt tarp. Budweiser took over the Kilt’s hut behind section 101. The screen behind home plate has been extended to just short of the dugouts. Annual golf outing tomorrow for the players. I hope to catch the minor leaguers at the Complex. The sound of bat on ball is coming soon. Can almost taste it. Got me Phils on MLB-TV internet. Going to begin to watch the transformation including some new faces in the 25. Maybe later they bring up a couple who’ve been doing well at LV AAA. Still hungrey as ever for the boys of Summer, Phila edition…’16, et seq. I do not understand why Philly press and Mackanin had Bourjos penciled in as a starter. He simply cannot hit. His slashes, other than one uptick year, have been evidence to that. Bourjos’ second half of ’14 was affected by his hip issue….he had surgery in October ’14 for that hip impingement. His ’15 ST was tentative. Throw in the fact he has been used irregularly and infrequently in both ’12 and ’13…..Trout was on the scene, so it really is hard to get a good take on what he can do on a full-time basis. It could happen here if LF is where the manager wants to play. Last week I wrote a straw man on why the Phils major league team wouldn’t be better this year. Not surprisingly, you all ripped into me. And after reading your comments, I think you were right and I was wrong on a few big points. 1. I underestimated on how improved the rotation will be. 2. My opening statement “I don’t understand the optimism for the major league club this season” was poorly phrased. A lot of you chimed in that the young talent is exciting. I agree with that. I meant to say “optimism about the win-loss record” but I didn’t say that and you were right to hammer that point. 3. While we agreed on the likely poor bullpen and I still believe the offense will be worse than last year, but I am more confident that the improved defensive play might make an impact. Although this is a question mark to me. fwiw, PECOTA has the Phillies rated as the worst defense in baseball, specifically our infield defense. But you guys sold hard on the improved OF defense and I am buying it. Anyway, I post a lot here because I like to learn. I make strong statements because that will solicit equally strong responses. I hope everyone enjoyed the healthy debate and learned something like I did. My new prediction: 68 – 72 wins and a lot of fun watching the Phuture play. Go Phils! The biggest weakness to this year’s team is the bullpen. Confidence is very low right now. The 5 starters can all have ERA’s under 2 that a very weak bullpen can turn into 95+ losses. The team still needs to get those last 6 or 9 outs. Maybe after ST is well on it’s way, I’ll feel a little better but right now the bullpen could give it all away. On offense, one thing I’d stress is to never give up a single AB. If the team puts 4 runs on the scoreboard, 5 or 10 would be much better. Never take the foot off the gas. Too many teams, in every sport, go into defensive mode when they get a lead. Look at the Flyers or any hockey team. If you score the first goal then you go into a defensive mode even if it’s the first 5 minutes of the game. The other team seems to tie it up instead of the team with the lead attacking and getting the next goal and the goal after that. Baseball can be very similar. Score 3 runs in the 1st inning and then hang on tightly to try and squeeze a victory. Attack, attack, attack and then attack again. If the opposing pitcher is having a great day, make him work for it. Foul pitches off as much as you can and try to get into the opponents bullpen as early as possible. The Yankees did it for years. I know they had very cagy veterans but the young guys should be learning how to foul off a really good pitch to live another day. Maybe I ask too much but a guy can dream. A little imagination and the BP might not be as bad you think. If the plan works and you can get more consistent outings out of the starters they should hold their own out there. With all the bullpen arms that Klentak brought in (strength in numbers and hoping that at least some of them are decent) I believe that they will put together a fungible bullpen. Now that’s not exciting by any stretch of the imagination but I don’t think that it will be a total train wreck. The pen doesn’t have to be a weakness. Pitchers that some believe should be a part of a 7-man starting rotation could be used as good bull-pen pieces. (I for one, believe that Eickhoff would be a monster as a late inning reliever, due to his swing-and-miss curve). Oberholtzer or Velasquez will probably be in the bull-pen and if David Hernandez pitches to his zips or steamer projections, he’ll be a steal. The rest of the pen is filled with the same kind of characters you see in bullpens every year, except they were smartly picked up on the waiver wire instead of stupidly handed 2 year contracts. The pen wont be great, but will be OK. I don’t think that the Phillies put Velasquez or Eickoff in the pen this year. Both of them have showed an ability to start and have reasonable upside as starters. I think they would have to fail pretty miserably as starters to end up in the pen but who know. I’m of the opinion that a high leverage reliever (Setup guys and closers) have more value than a bor starter but few people tend to share that opinion. Neither one of those guys have to fail miserably, to be placed in the pen. They have 7 potential starters and 5 spots. Velasquez was in a bull-pen last year, without failing as a starter and Eickhoff has has a grand total of 50 major league Innings as a starter. Sorry I meant to say fail miserably this year to end up in the pen this year. I’m not saying that neither of them will end up in the pen I just don’t see it happening this year. I agree. The Phils might well open slots in the rotation through trades at the deadline. Velasquez and Eickhoff fit as starters in the long term plan. @bellman – agree that the BP is the weakest link for 2016. It will be a revolving door throughout the year which is rightfully since the Phils has a lot of “unproven” arms that they can try and see a) who can be part of the next great Phillies team if they contend earlier than expected; and/or b) who can be a tradeable asset (ala Giles) that will help building the next great Phillies team. Other than Ramos and Cordero (and probably Araujo), i don’t any of the current BP arms (40-man and NRI) that will be coming back next year. I wasn’t part of that discussion v1 but I’m glad you’re on board. I’m generally a pessimist with respect to prognostications of my favorite teams, but the 2016 Phillies are significantly more talented that the 2015 version in nearly every aspect. If the pen is merely mediocre I’d say 75 wins is a legitimate possibility. My target remains 72 with a target of 82 in 2017. I think the starting pitching will keep them in more games initially plus I think the best of the LHV starters will be up at some point. The pen won’t be great but there are enough arms that I think it will be passable. However, the offense might struggle to score runs. I expect improved base running and more guys taking extra bases to try and score runs. Bottom line, we need our top 4 minor league teams to win and be in their playoff races. That will be fun for me. In the same manner one can look to improved starting pitching if only that 2015 was so pitiful, a like argument can be applied to the offense. The following player contributions are either gone or expected to be significantly reduced in 2016. It’s difficult to envision the 2016 version being worse offensively than the 2015 version. I’d say you are now a bit on the optimistic side. I don’t see the Philles winning 70 games in 2016, though I think they win a few more than last year. I will guess 67 wins. For the record, last year I guessed the Phils would win 65 games. At the All-Star break, I revised that to 58 wins. The Phils ended up winning 63 games, two games shy of the initial “prediction”. Anyway, I’ll go with 67 wins in 2016. There is finally some cause for longer term optimism, but the Phillies will still be among the worst MLB teams in 2016. Thanks for posting…nicely done Matt! that is my range of wins. not final record. JimPeyton and Chris Wheeler…two DELCO guys getting it on! Coincidence, maybe….Frieri and Alfaro battery mates in the third…first in MLB history…Colombian born pitcher and catcher. AJ Puk update…Saturday…26 Feb….the junior LHP, A.J. Puk (2.2 IP, 5 H, 3 R [2 ER], 5 K) did not have his best stuff, seeing limited action while hitting two batters, tossing a wild pitch and committing a fielding error. Team lost 5-3 to the ‘U’. yeah, he has not had a start that screams 1:1. Even if no one steps up to be the top pick they could always go under slot and then go over slot in the second and third round so I’m not overly worried about it. They have a lot of money to spend in the draft I just hope it they do it wisely. that would be a terrible scenario. 1:1 is supposed to be special. a rare opportunity to get someone great. that would be a terrible scenario. 1:1 is supposed to be special. a rare opportunity to get someone elite. Most professional drafts are major shots in the dark and the MLB draft is probably the biggest shot in the dark of them all. How many 1.1 draft picks are in the hof? KG Jr, who knows if A Rod makes it bc of the peds, Price should make it, Strausburg has a shot, as does Harper outside of them there are a lot of to early to tell. I hope that someone makes themselves the clear cut 1.1 pick but if it doesn’t happen it’s not the end of the world. Most years there are 2-5 players that could go 1.1 very seldom is there are clear cut 1.1 player. The Phillies seem poised to have a top 6ish pick in 2017 I just hope they strike gold with one of the picks. One hopes to hit a HR with the 1.1, but there doesn’t seem to be that type of guy in the draft. If the Phillies can do as well as they did with Crawford and Nola on the 1.1 and save enough $ to have a good 2nd and 3rd round signing, I’ll be thrilled. That is far superior to swinging for the fences and missing. There doesn’t seem to be a guy in this draft who isn’t a huge risk at 1.1. It wouldn’t be the worst thing in the world to sign the draft’s top position player and grab a pitcher or two later. The last time the Phillies had 1.1 they selected Pat Burrell. I’d more than happy with a cornerstone like that out of the first pick, but I would think i’m of the minority there. Groome is really being sold short here. Maybe it’s bc I’ve seen him in person but I’ve personally talked to 2 scouts who say he has Kershaw upside and even maybe slightly better. If that isn’t a clear 1:1 then I dunno what is. The ONLY drawback is he will take a little longer but even with being a HS pick I can see him moving like a Cole Hamels did. Eric D…..no one is selling Groome short….. he probably will be a great pitcher in the majors. Though it is a SSS, being sold short is the fact that HSers have never succeeded yet at the 1.1. And therein lies the risk for the organization. Look at the long list of first round (not 1.1s) HS pitchers in just the last 10 years that was posted here last week, of who have failed due to poor performance or injury. Still early on into the season for all the candidates. But Phillies (Klentak) keep talking pitching depth, however, perhaps a positional player will step up to the forefront and they could change their thinking. I have to temper my enthusiasm June 9 is quite some time away. I’m going to trust that one of these young players will separate themselves from the pack between now and then. Viewing the top 4 pitching prospects, I like Groom better than puk. He’s more balanced and coordinated in his delivery and movements. The only thing I didn’t like was the wrist flip at the back of his rearward extension. The 96 mph kid from oklahoma has a great delivery too. Puk has seemed less than elite so far this season, and I know it is early. I still am hoping Groome is everything that they say. Hansen’s stock is down and I have heard little so far on Pint. Those were the 4 we talked most about last year. MiLB released a rankings of Top Farms with stongers Arms/Pitchers. I expect that MiLB will have a deeper insights about the minors but I was wrong. I’m glad that the Phils made it in the Top 10, but I think it should be 2-3 levels higher. Tenth is about right for the Phillies. If Vincent Velasquez still had prospect status there would be an argument to be higher. The Phillies have Jake Thompson, a big question-mark in Mark Appel and what else? The teams ranked higher all have at least one Pitching prospect that is ranked much higher than Jake Thompson, and some of them have multiple pitchers ranked as high as him. It just seems like they should be higher to us, because Nola, Eickhoff and Velasquez just graduated their prospect status. Even so, the Phillies are in a good place with Pitching. Atlanta will further solidify their number one ranking if the rumors are true about them reaching agreements with both LA free agents Ven ss Kevin Maitan and Cuban OFer Lazaro Armenteros. The story was referring to minor league pitching, not overall system. Lazarito wouldn’t impact the Pitching rankings. Missed that.. thanks for that info. One thing I got out of that MiLB ranking of Top Farms for Arms is that Dylan Bundy is out of options. Either the Orioles stick him in their bullpen or he could be a guy available for the Philllies to think about claiming. rocco…we will have to see if it all translates into division titles and WS appearances in a few years down the road. Did see where the Cubs, graduating a lot of their top prospects to the MLB, have now fallen to 23rd in this ranking. I read somewhere (forget where) the Braves will sign Venezuelan catcher Abraham Gutierrez. Last March, Kiley McDaniel wrote, “scouts have said Gutierrez’s overall game is along the lines of Mike Piazza”. It looks like the Phillies will now NOT go over the international bonus pool for 2016. Disappointing. ….Kevin Maitan. Referred to as the “crown jewel”, scouted as the best 16-year-old prospect since Miguel Sano. According to Badler, the Braves are preparing to offer the Venezuelan teenager a country-record bonus of over $4 million (we’ve heard $4.25 million). The interesting part is that there isn’t a definite position that Maitan is expected to play – yet. Reports indicate that his offensive abilities are enormous, but that he’s also an athlete who might be able to play just about anywhere. …..Abraham Gutierrez. Another Venezuelan, this kid is a standout as a catcher, and has already played internationally on his country’s 15-and-under World Cup team (that event is contested every other year and it appears he will miss the 2016 event). How good is he? Badler suggests that the Braves are ready to give him something exceeding $3 million this Summer… second highest for Venezuela. …..Yunior Severino. A Dominican shortstop who switch-hits, Severino is listed as a ‘target’ for the Braves, which seems to suggest that he doesn’t seem to be as certain about the connection here. @Hinkie: It makes no sense to go over the International pool in the 1st year you have the most to spend, UNLESS there are a bunch of special talents that are not normally available in any given year OR you are a team at the back end of the pool allotments. The Phillies should spend every penny of there pool, up to 150%, but resist going over unless there is a special talent that is not normally available. They don’t want to be the Reds or Diamondbacks, and go over the pool allotment for a run-of-the-mill talent. Thers isn’t going to be any international draft next year. They need to maximize multiple years worth of talent acquisition. They can go over next year, when Cincinnati, Arizona, LA, Chicago, Boston, NY and Atlanta can’t bid for anybody. I don’t see the point of going over the international pool bonus when you know that the next year you are going to have another large pool. It’s better to spread out large signings over a few years because you will have the money to spend. Now if you know you are going to have a small bonus pool (when the big league team has proven its ability to sustain success) it makes sense to go over the pool because you won’t have a large bonus for a few years. For me … what’s the point of having the largest pool and having to settle for the second tier of prospects ? I’m not suggesting they overspend on run of the mill players; but I would offer obscene amounts of cash to guys like Maitan, Gutierez, Morejon, and Armentaros. If it’s true the Braves are set to pay Maitan 4.25 million, I’d offer him seven or eight million. Make it impossible for him to say “no”. Do you think the Red Sox regret paying Yoan Moncada 30 million ? If you wait until next year, you’ll be competing with the Yankees, Red Sox, and Rangers again. Instead, the Phillies can trade their allotments for 2017. Just my opinion. Hinkie…I sort of agree. One argument seems to be to do the way of a majority of the large market teams and overspend and grab as many as possible high end prospects. Plus….whatever money you cannot utilize due to the penalty imposed…trade for further prospects at higher levels. And still have the ability to sign prospects for $300K or less if a team has not traded all its money away. And th penalty is only for a two year period. More and more, I am getting the distinct notion that the Phillies do not want to incur the financial tax involved….whereas LAD, LAA, Cubbies, Yankees, Red Sox, Rangers, et al do not let that deter them. Who says they’re going to have to settle for 2nd tier prospects? The “buscons” have newspapers. They know which teams have large bonus pools. Be logical, and stop letting message boards get you in a panic. Maiten isn’t the only prospect that’s coming this year and Lazarito isn’t even a top 5 prospect according to some professionals. So what is all the hand-wringing about? One guy (Maiten)? Either way, it’s only March. The Phillies have signed a top 10 guy each of the last 3 years and we never get the news of who they’re targeting until at least May. So anon, you are saying that the following year will be the year to bust the pool because the year after that is projected to be the beginning of an International draft? Because I am waiting for the Phils to stop being good boys and start using their money advantage. I know it is not yet time for Major League FAs but would like to know when to expect them to be linked to any top International player. I just hope they use theor entire pool. They spent $4.25 million on one guy last year. The numbers for the guys the Braves are rumored to be signing are in that range or lower. The Phillies obviously you going after them instill not go over their allotment. Has anybody heard anything about whom the Phillies might be in on for Latin American signings? Anyone know when the team groupings are typically released? I think it is soon but cant remember from previous years. It should be soon because minor league camp opens Thurs I believe. So where are the pictures of the cheerleaders and dance team from Tampa?? They are sooo young. I didn’t want to be mistaken for a stalker. Cliff: Lazarito to the Dodgers if he signs before the deadline? Braves if after? Steve Adams: I like both of those picks. Phillies or Padres seem plausible as well if he waits for the 2016-17 class. Evan: Top picks to sign Bryce Harper after 2018. Nats? Yankees? Dodgers? Steve Adams: Yeah — I mean you have to just give the edge to the highest-spending clubs. Throw the Red Sox in too, I suppose. Maybe the Phillies. I’m hoping that a few clubs that would never normally spend at his level just decide it’s a once-in-a-generation opportunity and make a crazy push for him, just because it’d be fun. Harper at 26-years old…now that would be something for the Phillies if that ever materialized. He could entertain offers at probably12/13year/$.5B contract or who knows even more in three years from now….with the now in vogue, ‘opt- out clause’ of course!. It rarely works to sign a guy who clearly just wants to set out to break a contract record. It didn’t work for the Giants when they made Bonds the highest paid player, it didn’t work for the Ranger’s and A-Rod. And it didn’t work for the Yankee’s on the second A-Rod deal. 2009 WS I believe was on the Rangers dime. There are some people in the game that will tell you Piazza is the reason the Mets didn’t win a WS. He and his weirdo contract demands, his private locker away from the rest of the team, his taking flights on his own to away series alienated most of the 25 guys on that roster. So Nah I’ll pass on Harper and take a group of guys that came up together who see themselves as the dirty dozen so to speak and sprinkle in a few veterans. IDK maybe I’m wrong but jerks don’t win championships. They may win a lot of games and be damn good players but juxtapose Trout/Harper, juxtapose Jeter/AROD. I feel bad for Trout. The Angels were onto something before they wasted so much money on an old Pujols and Hamilton. That’s my rant for the morning fellas! I agree with you on this point. a team is better off spending the $300 million that Harper will get on 4-5 players who collectively can make the team better than one single player can do. You can work around a great player, just like teams that walked Bonds during his steriod-fueled heyday. long-term, massive $$$ deals almost always end poorly for the team.. I like your rant. As a fan, I don’t want jerks, either. I loved the attitude of the circa 2006-2007 Phillies before certain key players became entitled. Give me that kind of team again. Or the rollicking Kruk-Daulton-Anderson gang. Baseball should be fun, and it should be about rooting for the home team, at least from my perspective as a fan. Players and team owners obviously have different perspectives and interests. I have no idea how Harper thinks or what the situation will be in 2018, but if it were me I’d be thinking New York Yankees all the way. To be the center of attention in the world’s media capital and following in the line of Ruth, DiMaggio and Mantle would be more than a once in a lifetime opportunity. It would be a once in the lifetime of every player for every generation of players since Mantle. It’s a chance to be historic. And the money from the celebrity that would follow would be greater than the difference in the bid of whoever might offer more. FrankF…..you are probably right. Harper may want the New York scene and tradition or then again maybe even the West Coast like LA. I do not think some place like Milwaukee would be high on his wish list. Or he could want to screw over the nats and sign with a division rival like us. It’s still ok to daydream right? What are your thoughts on waiting for Shoehi Otani to ask to be posted and then breaking the bank on him. He’ll probably pitch a couple more years in Japan, but I believe he has an agreement with Nippon Ham Fighters where they will post him when he asks them to. Only 21 YO. He throws 100 MPH and has a wicked breaking ball. I know it’s risky spending big money on hard throwing pitchers, but he has unbelievable talent, and would be the same age as the Phillie’s next generation of star players. And the days he isn’t due to pitch, he can pick up a bat and start smashing from the middle of the order. 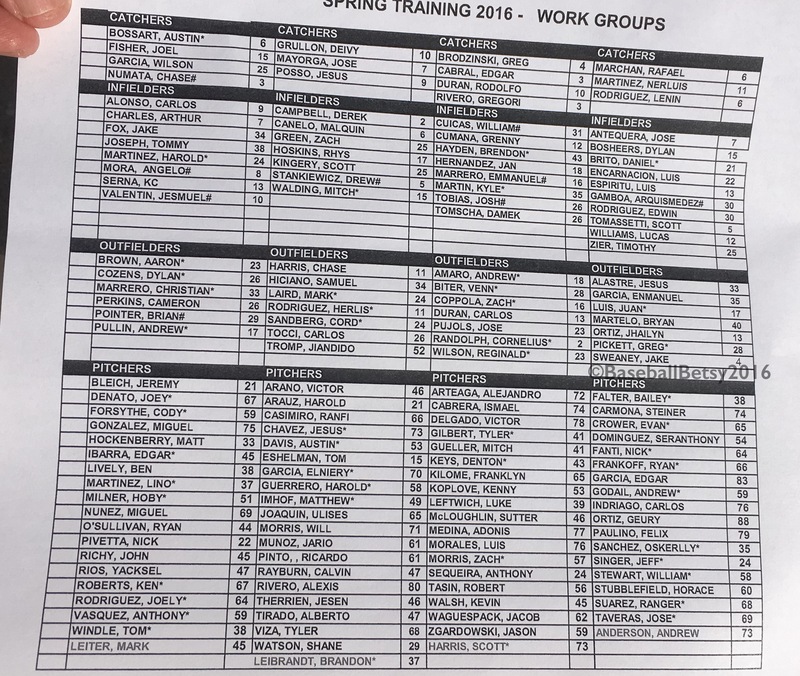 I would have like to have seen more of the prospects today aka Crawford, Quinn, Williams, Knapp, Sweeney, Goebbel etc. We all know what Galvis and Hernandez , Howard , can do. I mean the near furture is going to be more to watch. Tim TimmAAAA-I get you want to see those guys but the club knows none of Crawford, Quinn, Williams, or Knapp are breaking camp with the big club no matter how good or bad they look in Spring training games. It is also game 1 of what is a terribly long season. Goeddel is the one name that was kind of a surprise not to see. Given that he is Rule 5 and you have to decide his fate or a 25 man roster spot based on ST.
Goeddel is sick, will be in line up shortly. I get the South Park reference. Lol south park hmm kinda old school. DMAR are you the singer from Reverb nation. I know and JPC , Quinn started today when the Phillies today weren’t on TV. I’d just rather watch JPC , Quinn , Knapp , etc when there is a chance too. Their not going to be in Clearwater to long as you said. The younger pitcher’s as well as Franco and Herrera plus Goebbel should be up all yr. I hoping Williams , Knapp maybe Sweeney and Featherston too. Along with Quinn leading off. Such a cool thing to see! They both have about two weeks to show their skills and to soak in the feeling. Minor league games start around March 15 and the first cuts will be right around then so they can play every day to get ready for their season. Pretty sure today’s game isn’t being televised. However, tomorrow’s game is on CSN, and Jake Thompson and Zach Eflin are scheduled to pitch. There has to be some type of balance between a purely analytical approach and considering the heart and determination/will of the player. I’m sure there are several hall of famers who wouldn’t have been high on a annalytical board. Tgat being said; A batters OPS while factering in speed, overall defense, teamsmanship (lol) and gamesmanship would be good starters for analytics. On the pitchers side; opponents ops with an awareness for gamesmanship would outweigh era and ‘wins’. There should be a balance; as you say, not everything can be determined by statistics. Nothing is preventing scouts and coaches from estimating intangibles and then entering those into databases as facts, then seeing if they can extract even more predictability than statistics alone. It could work, or it could show that human error is too large to overcome with things like work ethic. Agree, balance is the key. Though a little surprised to hear the Sox owner downplay analytics to some degree last week. And there will always be outliers on both sides of the spectrum….Rays analytical dept lobbied for Cub;s Chris Carpenter and the scouting dept insisted the Rays to take Chris Archer in the Matt Garza deal in 2011.Scouts seem to get that one right. Funny because Moneyball was on the other night (I love that movie) so I turned it on and caught the last 45 minutes. He pawns himself as some type of an innovator when he is just part of the shoal. Thought that moneyball was rather self-serving myself. Being sold has how brilliant Beane was in using alalytics without even a mention that the main reason the team was good had something to do with Mulder, Hudson, Zito in the front of the rotation. Seve Gonzalez was comfortably in the low 90s but missed with his pitches to the first base side consistently. Gregory Infante threw about a dozen of his pitches in the 96-98 mph range. I didn’t realize he had this kind of velocity. David Hernandez was low 90’s, T94 mph. Edubray Ramos was 93-94 mph with a good change up. Had to leave after the 7th. Interesting, thanks Jim. Sev definitely looks bigger this year so I was curious if it translated into more velocity at all. I guess it did for two innings, at least. Infante looked like he had pretty good stuff on TV, just didn’t really know where it was going. Ty Jim Ramos I think I saw a CB too he looked good.Sev getting bigger with more velo is good news. Phillies have a top seven farm system, according to MLB Pipeline. #10 Astros and #9 Brewers were revealed yesterday. The Pirates were unveiled at #8 about an hour ago. #7 should go up sometime this afternoon. #4-6 tomorrow and #1-3 Friday. Phillies are seventh according to MLB. 23. Cozens: “…As Cozens hits the upper levels of the system full-time, he’ll need to show that the improvements he made in 2015 will stick. Ain’t that the truth…there has been more ‘dicsussion’ on those four than any others that I can recall in years. And MLB lumped three in that 20-25 range. Something less than an everyday role for Hoskins would probably mean he’s in AAA, but that’s part of the problem with his profile. I doubt he gets a chance in the OF corners like Ruf did. Overall I think the list is better than usual for MLB. I’d like to see Grullon a bit higher, but for the most part I’ve got no serious gripes with the order. Seve is probably way down in the teens as far as the SP hierarchy. Does he have a future in the Bullpen? And a guy I am also anxious to see is Eshelman. Does his elite command play as the competition gets better? There are so many guys to watch, and that is what this season will be all about. I think he drops way down in the later half of the season, unless he shows a lot in AAA, but early in the season he could be the first or second guy up if the Phillies need a pitcher, I think they will want to be cautious with Thompson, Apple, and Eflin, so Sev just has the lesser guys to beat out early to be first up. MLB are in negotiations with Cuba to let teams sign there players right from thee league’s. Wow game changer now no draft needed. I didn’t know Canelo went through the Phillies strength program twice. I do not think that is unusual for the LA guys over a 4/5 year period they are in the states. Tocci may have also had a few sessions. I know about Tocci he needs , like 5 more. Canelo was much better last yr with the bat. I guess many of us had Windle, Arano, and Ramos as borderline top 30, but I’m surprised that they threw Ascher in their, had Garcia at 22 and Lively unranked, although I had Lively toward the back end of the top 30. He just did not look that good compared to some of the other SP’s at Reading last year. Going to catch up with you (Jim) tomorrow at the complex and check out the Stros game! Elniery Garcia is the biggest surprise to me. MLB is the only one who ranks Garcia in theTop 30, althought it’s borderline. Given the additional prospects that join the Giles trade, breakout performaces plus Rule V, it’s really a surprise to see Garcia jumps in the ranking. If Garcia ends up to be Yoel Mecias (pre-injury), then he might end up as the sleeper for next year. BA has him in the top 30 as well. I guess the Carpenter Complex will get further crowded when the remaining minor leaguers show up later today sometime. i know it’s spring training, but i think i’ve seen what Howard will do for the Phils in 2016 just watching today’s game vs Astros. Bottom on the 2nd, 2 man on base with 1 in scoring position, 1 OUT – the Big Whiff Struck out!! Same scenario in Bottom of the 4th – man on 1B and 3B, 1 OUT – the Big Whiff grounded into Double Play! KuKo…..but you had to like Eflin’s velo…reported by the announcer,TMac, at 94/95 in his first 30-pitch inning, and Thompson also showed life in his innings pitched.. I am sure Jim will have all the numbers. Same ole, same ole. Nothing to see here, please move along. I can hear the chant from the LF bleachers now, “Stassi, Stassi, Stassi.” “Ruf, Ruf, Ruf” sounds like a dog barking. Featherstone with 3k, 2errors, GIDP, and 7 LOB. We have all grown tired of the Ryan Howard act. They need to make a decision on Darrin Ruf moving forward. Featherston did great in the SAL league at age 22. Since then, each season has been worse than the year before. Last year, he made the majors for the first time at age 25. He struck out in 30% of his AB, walked less than 5% of his AB, and hit .162 with an OPS of .459. He may progress this season, but I think you are safe in assuming that rust isn’t his problem. His stats, while declining, were at least ok until last season, so perhaps he was hurt or being pushed up to MLB after just a very short stop in AAA was just too much for him. Yea but his plus arm and plus defense at 2nd he could go down to AAA and get some at bats he looked like he was pressing.he has speed too he may never be a good hitter . Bourjos on the other hand was a plus move because we lacked OF depth at the big league level so I’m on board with that. Knapp and Doobie are off to impressive starts. Alfaro looked good the other day. It would be great to have a really tough decision on our future Catcher. Lino threw out a runner today, it was a cannon of a throw and it was right on the money. I Dvr the game I had my Dynasty draft today . My friend and me in the 3rd rd wrote down the same name passed it each other Kingery. We’re stacked everywhere but 2nd and Catcher. Anyway he just came back from Clearwater all the chatter going on down there was about the prospects.he asked a veteran coach who he thought would be the first Gloden glove player he said Herrera. To each their own but I hate fantasy unless it involves Scarlett Joha oh never mind! A fantasy and draft and Dynasty draft in baseball are different. Dynasty drafts you basically pic minor leagues player’s after about 3 yr . You keep your team form the following yr. This league is 12 yrs old the rule the and has ten teams. The one rule is the drafted had to be at AA or has to get there by the end of the yr. I don’t do fantasy leagues either anymore. Now if I wanted to dream a dream kate Beckin …..
Tough break for one of the top prep arms available for the 2016 draft … but … could be just the thing the could work for the Phillies ! LHP Jesus Luzardo may have to go under the knife for a torn UCL. It’s the same injury (and surgery) Jeff Hoffman, Lucas Giolito, and Brady Aiken all had. Luzardo had been throwing as high as 97 MPH before the inury. He now could be a candidate to fall to 2.1 or maybe even 3.1 where the Phillies should have the extra money to overspend on him. I would definitely take him at the 2.1, but guys like that (Lucas Giolito) are usually taken in the later portions of the first round by play off teams using the same logic. I doubt he makes it to the 40th or so pick. You’re right. However, the difference is (according to the lists I have seen) Lazardo was predicted to be a late first rounder before the injury. Aiken, Hoffman, and Giolito were all top of the first round guys. Herrera looked real solid both in the filed and at the plate. He goes full tilt on everything, at the plate (when he connects its line drives), on the base paths (great for a top of the order guy), and in center. Man it was fun watching him Bourjos and Williams in the outfield. Bourjos does not connect at the plate with the same authority as Herrera but again he looks like a decent top of the order guy and great outfielder. He was good on the base paths but made a rookie mistake (I think it was him) when he over slid 2nd going for a steal which I believe he had. Knapp was good in the three hole getting a couple hits to set them up for big innings, unfortunately the 4 and 5 hole hitter were not producing except for 1 play where Ruiz drove in one. Williams was all or nothing at the plate with a hit, two walks, and two whiffs. Unfortunately one of those came at the end of the game when an extra base hit would have won it. However for a first time MLB spring trainee he looked pretty good beyond the two so’s. Hernandez and Galvis were ok, but had a combined 8 guys left on base. I mean this was never close to being a big O day like with the Yanks, but these guys were pretty poor with men in scoring position. But the big hat for the day was mister Featherston. I mean he had his GM running for the exits as a multiple threat for the other team. He single handedly left 7 men on base, had 3 strike outs where he looked clueless, and than hit into a DP to end what could have been a big inning. He also had two run producing errors in the field. Stassi accounted for himself well by hitting one that he got robbed for a hit (still knocked in a run with it). He also walked, and looked like he belonged at 1st. Lino looked good behind the plate, got a walk and I think he was the guy who gunned down someone at second. We did not talk about him much that I am aware of, but he looks like he has put on some muscle and he is a pretty big boy. He still relatively young as well. The Phils are definitely stocked at the catcher position. Thompson looked like maybe he had a bit of nerves since he was not sharp like I have seen him at Reading but he barred down well when he got in trouble which I’m sure the coaches loved to see, and if not for a Featherston boot he would have not taken the loss or a given up a run. Eflin did not look as tentative as Thompson at the start but he did get in trouble 1 inning and again another flub from…….. Overall he looked good even under pressure, although he gave up two walks to get himself in trouble. Freiri, its funny there was some article I saw on Comcast that he learned something from Cano but all I could see was the ball that Duffy hit which sailed way over the Tiki bar and may still not have landed. Talk about serving one up. Russell, Aurajo, Burke, and Murray all looked good. I here it every year I go to spring training…..and sit with fans from other teams……we have the best mascot! Good report, keep them coming. Thanks DMAR and Guru, it was my pleasure! Did you happen to see the velo on Eflin…it was reported 94/95? But not sure he sat there or touched it. Hey Rom, ya I couldn’t say it sat there because I could not always identify all his pitches but I would say his fastball seemed to consistently hit there. The Speed indicator is now showing on the televised games. Phils probably play better than the Astros despite the loss. Good game for everyone except for Howard and Featherston with the latter breaking camp to join LHV and development. For Howard, why he continues to bat 4th is mind boggling. For today’s game ATL, Howard leads off the bottom 2nd with a K, and ends the big inning with another K.
We all know that Howard will be part of 25-man roster in regardless, so why can’t Pete just try somebody else in the cleanup spot? Ruiz and Howard should be batting in the bottom of the order or just comes out from the bench fo situational hitting. Simple Kurt you are paying him $25 million and you would like to unload some of that if you could. If he gets going and gets on a hot streak maybe an AL club comes calling for him. No one is going to give us much for Howard by way of prospect(s) but whatever salary the Phillies don’t have to pay is a bonus. That was the theory when he was allowed to continue starting through September 2014. It didn’t work then, it didn’t work playing him a ton in 2015, and he isn’t going to magically get better, instead of the normal worse with advancing age in 2016. TIme to trade him really cheap (like pick up all his salary above MLB minimum and get back somebody’s 40th rated prospect down in A ball. For those who are nostalgic for Howard’s last year in Philly, you’ve already had 5 of what should have been Ryan’s last year in Philly. @DMAR – i understand your point but like what Allentown said, the Phils tried (and waited for the hot streak to come) that the past couple of years and it didn’t work and it’s safe to say that it will be the same in 2016. if the Phils still decided to keep Howard in the roster, he should be a) not batting clean up anymore and b) mostly LH bat from the bench. The future of 1B is will be most like a combination of Knapp or Alfaro, Hoskins, Franco or a free agent. If the Phils wants to get lucky and get something from the “place holders” they have right now, the Phils probably will be better showcasing either Ruff or Stassi than Howard since they are both younger and cheaper. Both Ruff and Stassi are not part of the future so the Phils can try to get something from both as much as they can. @anonymous – i just compared Ruff/Stassi trade value to Howard (which means it little to no value) and clearly said that they are just “place holders” – so don’t over react. Do you really care if Middleton gets more profits ? We’ve been waiting 3 years for Howard to get going. It’s EXTREMELY unlike that will happen. He has no value, in fact, the last few years he has literally had negative value. He’s a great guy; the best first baseman in franchise history, but his time has expired. They need to move on from him. Your not going to win this yr they have maybe Stassi that’s really it. Howard gone next yr. C Herandez won’t be starting next yr neither will Galvis be well , not at SS away. It’s going to be like last yr players going up and down. I Think there was 11 prospects done to make there BIG league jump this yr.
Andrew Bailey with his first inning of the Spring. It went well. He is a feel good story and a local kid. Rooting for him to make the team and contribute in the ‘pen. Altherr injured his wrist in the first inning of today’s game diving for a ball. Hopefully, it’s not serious. Live on west coast…got to watch game today. One comment: I have loved Ryan Howard, but it’s time. We traded Thome to give Howard a shot. How do we move Howard and create a platoon for Stassi and Ruf? Stassi looks like he is ready now! I am planning a trip to see the Iron Pigs play. Can someone please help me with a hotel recommendation. I would like one close to the ballpark and the casino. Thanks for any help. Slin, You really can’t go wrong there are a ton of good hotels in the area. Personally I would pick the Hampton inbetween the two. But if you got the bucks and want to do it up just stay at one of the Casino hotels. The ball park is just a few miles away. Just avoid car travel from 3:30 to 6PM…also 8:30 to 9AM in the morning. You can travel by car during rush hour if you stay off of route 22. Use Union Blvd. (and other back roads) to get to the park. It will still be busy, but it will move. Getting out of the park after games is often very slow–plan on at least a half-hour. Hey PC do you live in Allentown / Bethlehem area? If you do you have learned the ways and holes, but to someone not from the area it can be confusing. Yes if you live in the Philly area ABE can seem like a breeze but being someone who has lived in both areas and in the suburbs and traveled the states its not layed out that well for all the traffic that’s there. I would recommend them taking a Taxi if they are staying at the Casinos. Not disagreeing with you just offering an alternative view. I live in Bethlehem. Taxis in the Lehigh Valley are touch and go…not always on time or easily available. Uber is often better, but a good GPS will get you from the casino to Coca-Cola park via thee back roads pretty easily (Union Boulevard). The ballpark and casino are about 15 minutes driving time apart. If you can swing it, stay at the Casino hotel itself. One can often find really good deals on rooms if you play a certain amount in the casino. The Historic Hotel Bethlehem is a great place if you like historic hotels and it has really good food. Rooms have been remodeled. The Hyatt place in downtown Bethlehem is well rated–clean and friendly. There are many inexpensive motels along airport road near the park. Hampton inn and mariott suites are clean and friendly, but not the cheapest of the “chains”. Edubray Ramos comes into the 9th (after Hector Neris has walked the bases loaded and walked in a run) and promptly throws six straight balls, nowhere near the plate. Classic. They have 24 relievers vying for 7 spots. Maybe Hernandez is a lock, but they may go through all 24 before the season is over. For those interested….AJ Puk pitches today at 4PM vs Ivy power house the Dartmouth Big Green. Phillies GM Matt Klentak was an infielder for Dartmouth in his playing days back in 1999 thru 2002. My guess, the Phillies GM may take a ride over to Gainseville for some scouting and a small reunion with old coach Bob Whalen. Phillies seem to have a logjam in the outfield and behind the plate. At catcher, you have Rupp who looks like a future backup but might improve. Then there’s Knapp and Alfaro. Following are Lino and Moore, both looking like defensive backups. Lots of outfielders when you start with Herrera then add prospects like Goeddel and Nick Williams, and the fleet Altherr and Bourjes. Maybe more if a Dylan Cozens progresses. And we haven’t even mentioned Cody Asche who, who knows, maybe break out at the plate this year to give us a solid, mid-power bat. None, except maybe Herrera, and Williams if he pans out, appear to be certain future starters. 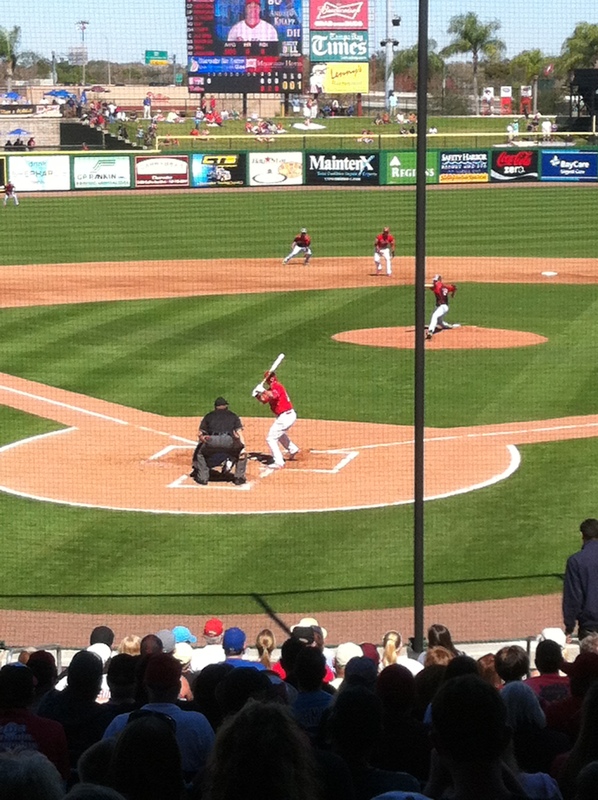 Solutions at catcher include putting Alfaro in the outfield to take advantage of his athleticism and cannon arm. Another often mentioned is putting Alfaro and/or Knapp at 1B, though Knapp might not have the power associated with that position. There is some skepticism expressed over Franco’s defensive abilities at 3B, which seemed to fall short of his billing last season, and some suggestions that he move to first base. However, if Franco is at first, the organization doesn’t have a certain strong 3B and the club still hasn’t cleared the clutter at catcher. And if Alfaro is moved to the outfield, the clutter there becomes greater. So, after all of that build up, here’s the question: Why not convert Alfaro to 3B? That would take advantage of his athleticism and his cannon arm, allow Franco to move to 1B, not further clutter the outfield, and have one less catcher in the mix. I doubt Cody Asche breaks camp with the team, barring injury to other outfielders. Klentak has prioritized OF defense with his acquisitions and I can’t see him undermining that by putting Asche out there, when he really doesn’t even hit well enough to make up for his glove. It will be interesting to see how it all shakes out. I guess the good news is they have some options should there truly be a logjam at some point. For now they have the good situation of watching the cream come to the surface and then deciding what to do at that point. After watching them all play together this week, I think the future is bright and to consider what the future looked like a little over a year ago, you have to give the org some cred for turning this around, so far, pretty quickly. I was thinking I would not be watching the big club much anytime soon and stuck in Reading. Now I’ll not only be enjoying Reading, but enjoying Allentown, and Philly as well. Just think you had all the talk in Philly of what free agents were going to fill all the holes. Yes we still may need a FA or two to make it over the top but who would have thought it could have potentially been this soon that we had hope at almost every position with our own kids? I know some of you are guru’s at this but I am amazed at how quickly this org has become fun to watch again. FranF…Cozens could still end up in the infield at first. He certainly looks like a first baseman. Just thought I would jump in on the Howard conversation and throw Chooch into the mix, and maybe give more of a heart view verses a head view after watching them with the kids this week. Its clear to see the value Chooch gives both from a head and heart view. You can argue that he is overpaid but keep in mind that this will be it. He and Howard are in their transition years of trying to figure out what to do with life after being a player. I’m sure if they have half a brain they have thought about this way before now, but now you can clearly see them carry themselves differently than they did in springs past. They both seem to be taking their roles as mentors to the younger guys well. Yes, they both are competitors and want to keep playing and you would expect that from two guys who have been successful at their craft, however I see both ready to let go a bit and be mentors. Maybe its because all of the negative press Howard has gotten versus Chooch, but Howard seems the most ready to move on. I keep hoping that since the Phils know there is no way to move him and get anything back at this point, that they work out some type of ambassador / player role for him this year. It would be ideal if he retired, however if I was a Phils owner I would be offering to pay him the money just to take on that role. Again keep in mind that this is my heart talking. My head hears the arguments you guys are making and I can see all of your points to some degree. However, I do see a side of Ryan that wants to move on as well and I’m hoping that if they offer some type of roll where they can play others at first….I have seen a slew of guys over there this week taking warm ups….maybe his transition will only be a mess with the Philly press? Unlike Howard, I can see the Phillies getting something for Chooch at the trade deadline if he rebounds a little from 2015. The biggest knock on Chooch defensively is pitch framing. Not too late for coaches to try to teach a new trick to a very old dog. Oh two more thought on the big unit…and Chooch for that matter. Being 55 I am at a point in my career where I am thinking of transitioning. I still have 3-5 years to process that. Imagine being 30 something and knowing you have to do it now. I can’t imagine doing that. With 55 years under my belt (and a bit over it ;-), I would have trouble doing that in a years time now. There is no way in hell that I could have done it at 40. Oh also, I have never seen a guy bigger (size wise) in baseball who has been so successful. I know there are other guys but I have not personally watched them. I mean talking about expanding the strike zone. Lends even more to his success through 2011. Watching him now at the plate is painful. Oh two more thoughts on the big unit…and Chooch for that matter. AJ Puk’s second game vs Dartmouth. Puk is not 1.1 worthy. BTW … Robert Tyler of Georgia is having a very good start to his junior season. He’s one year removed from TJ surgery. I probably should say Puk is not 1.1 worthy so far. I know there’s still 3 months until the draft. I don’t hold his early season stats against him, but to my untrained eye, Puk doesn’t look like anything special. Very average looking from delivery to his body. Looks like your average 1st round LH pitcher, but not a 1:1 candidate. After 2 bad outings this season, Alec Hanson had his first good start for U Oklahoma this weekend. He allowed 4 hits, one walk, and one earned run while striking out 11 in 6.1 innings in a loss to UCLA. Cooch has retirement plans end of yr unless he gets a back up job. He’s going to a job coaching he is 1 of the best at calling a game . He really doesn’t move around that we’ll any more . Minor league camp started on the 5th and the Blue Jays AAA and AA come to Clearwater on the 15th for the start of the spring games. If anyone is interested Baseball Betsy has the workout groups posted on her blog. There’s a link to her site on the front page. I know a lot of people usually look forward to seeing it. interested to see what some of the injured guys from last year do, Zack Green, Sam Hiciano, Drew Anderson, Jake Sweeney. That also interests me…especially Zach Green. Third base is one area that is weak in the system and he could very well seize the opportunity. However, not sure if he will be playing first or third, just assume third. He will probably start at CLW, and this is his 22age season, so he needs to make some headway and also stay healthy. They better get this draft right. They need a ace. And nola isn’t it. The more I see of him, the less I like him. I just think he will be a 500 pitcher on a good team. rocco…..why do you think that? IMO, he will be better than a .500 pitcher…maybe not 17-18 winner, but in the mid-teens around 14-15, with maybe 7/8 losses. But also important he will pitch 180/190 innings plus every year. I don’t think Nola is an ace, but that’s ok. It he’s a 3, that’s ok. Have you seen what pitching costs these days? Those days of the 4 aces are long gone. We need to field a competitive team. Nola will help us to do that. Andrew Knapp just jacked a HR today. Makes me wonder what will happen if Knapp has a torrid start to AAA. For sure, he won’t come up before that certain date to keep him from being super 2. But if he has nothing to prove at Lehigh (he’s already 24), he might force the Phillies to cut Ryan Howard during the season. No, he’s a catcher. The Phillies will make every effort to develop him as at least an average defensive catcher. His bat can be special as a catcher. It will be ho-hum at first base.